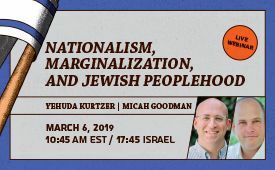 As a result, this year's David Hartman Memorial Conference for a Jewish and Democratic Israel on March 6 couldn't have been more timely, with the April 9 national elections in Israel and similar debates in the US. Hundreds attended the Conference at the Hartman campus in Jerusalem. The program included an opening presentation and breakout sessions. As well, the annual evening in the memory of David Hartman, Institute founder, occurred at the session's end. Video of a classic David Hartman lecture shown at the evening in his honor.